The onset of these devastating diseases is associated with the inappropriate clumping of proteins into particles that are harmful to cells in the brain (Alzheimer’s disease and Parkinson’s disease) and pancreas (Type 2 diabetes). Antibodies, which are commonly used by the immune system to target foreign invaders such as bacteria and viruses, are promising weapons for preventing the formation of toxic protein particles. 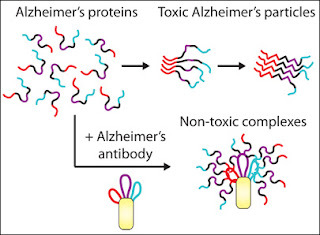 A limitation of conventional antibodies, however, is that high concentrations are required to completely inhibit the formation of toxic protein particles in Alzheimer’s, Parkinson’s, and other disorders. To address this limitation, a team of researchers led by Rensselaer Professor Peter Tessier has developed a new process for creating antibodies that potently inhibit formation of toxic protein particles. Conventional antibodies typically bind to one or two target proteins per antibody. Antibodies created using Tessier’s method, however, bind to 10 proteins per antibody. The increased potency enables the novel antibodies to prevent the formation of toxic protein particles at unusually low concentrations. This is an important step toward creating new therapeutic molecules for preventing diseases such as Alzheimer’s and Parkinson’s. This research was conducted in the laboratories of the Center for Biotechnology and Interdisciplinary Studies at Rensselaer. Tessier’s research represents a new way of generating therapeutic antibodies. Currently, most antibodies are obtained by exploiting the immune system of rodents. 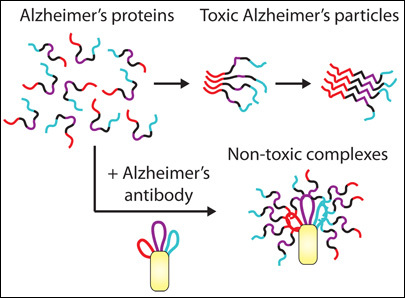 Mice are injected with a target protein, for example the Alzheimer’s protein, and the animal’s immune system generates an antibody specific for the target protein. Tessier’s method is radically different as it relies on rational design approaches to create antibodies based on properties of the target proteins. Along with Tessier, co-authors of the paper are Rensselaer graduate students Ali Reza Ladiwala, Moumita Bhattacharya, Joseph Perchiaccaa; Ping Cao and Daniel Raleigh of the Department of Chemistry at Stony Brook University; Andisheh Abedini and Ann Marie Schmidt of the Diabetes Research Program at New York University School of Medicine; and Jobin Varkey and Ralf Langen of the Zilkha Neurogenetic Institute at the University of Southern California, Los Angeles. This study was funded with support from the American Health Assistance Foundation, the National Science Foundation, the Pew Charitable Trust, and the National Institutes of Health.